Quinoa (pronounced keen-wah) is one of the new super foods, except it’s not that new. The Inca’s cultivated it for domestic use more than 3000 years ago and referred to it as the “mother of all grains”. But it isn’t really a grain, it’s a seed and as such contains no wheat or gluten and is very low GI. It’s one of the few foods to contain all 8 essential amino acids, in fact it’s closely related to beets and spinach as they are both chenopods. Anyway enough of the nutritional mumbo jumbo all we need to know is that it’s not only delicious but good for us! A lot of recipes will tell you to cook quinoa with a 1:2 ratio of quinoa to water i.e. 1 cup quinoa to 2 cups water. But I find this results in a somewhat gluggy consistency. So for perfect fluffy quinoa I recommend a 1:1 ratio. 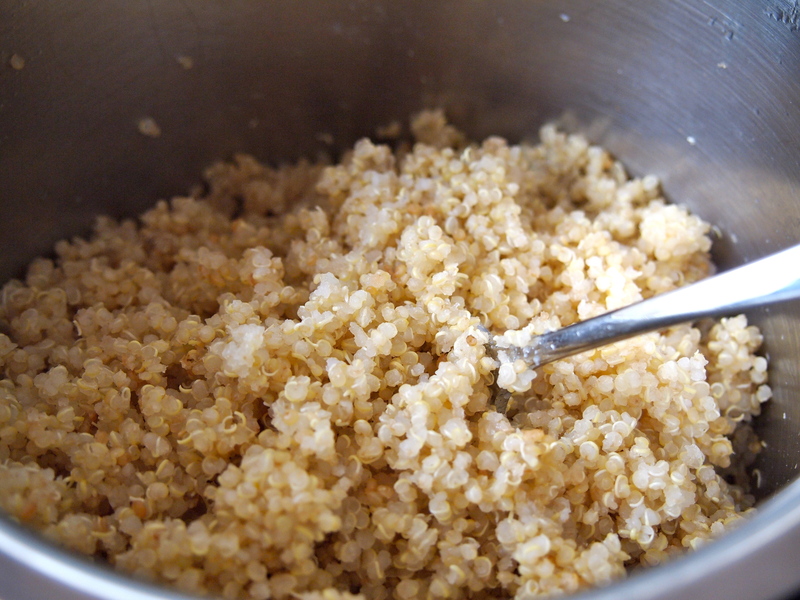 You also need to know that unless your quinoa has been pre-soaked (this will be stated on the packaging) you’ll need to soak it for 15 minutes before it’s washed, drained and cooked. The exact directions are in the recipe below. Now onto the labne. How I love this stuff. Labne is just greek yoghurt which has been strained through a cloth to remove the whey leaving behind a cheese like substance but with the sour tang of yoghurt. It can be a great (and much less expensive) substitute for goats cheese and can be flavoured with anything you like, in this case garlic and mint. 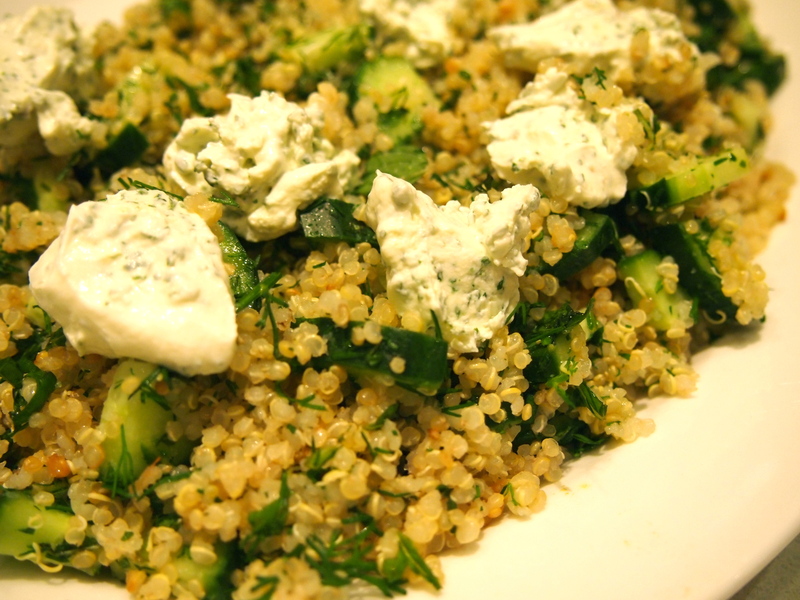 The quantities for the labne below will make more than you need for the tabbouleh but the leftovers can be served with toasted pita bread as an appetiser. I made this salad to accompany a barbecued butterflied leg of lamb with Middle Eastern flavours. Enjoy! If possible begin the minted labne the day before, however I have made it on the same day with a soaking time of 5 hours and it’s worked but overnight soaking will give best results. Place 100g yoghurt into a mini food processor with the garlic, 1 cup mint leaves, 2 teaspoons of the olive oil and 1 teaspoon salt. Process until the mint is finely chopped. Stir into the remaining 400g yoghurt, then spoon into a sieve lined with a square of muslin or a clean chux. Place the sieve over a bowl, then fold the edges of the muslin over the yoghurt to cover. Place a small plate on top to weigh it down and leave to drain for 24 hours in the fridge. To make the quinoa place the soaked and drained quinoa into a saucepan and add 1½ cups cold water, ½ teaspoon of salt and the butter. Bring to the boil, stir and reduce the heat to a very low low simmer, cover with a tight fitting lid and cook for 30 minutes. Remove the lid and fluff the quinoa with a fork and place into a large bowl. Thinly slice the remaining mint leaves and add to the quinoa along with the dill, cucumbers and spring onions. Add the lemon juice, remaining olive oil and season with salt and pepper. 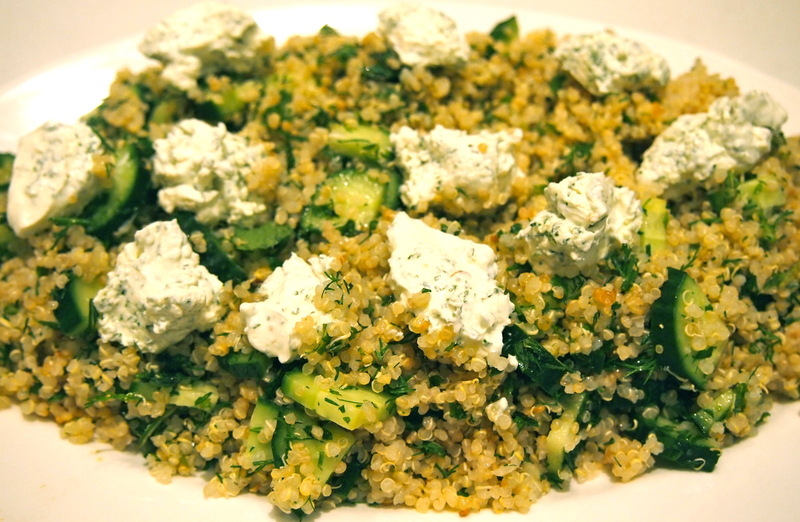 Spoon the tabbouleh onto a serving platter and crumble some of the minted labne over the salad. Serve at room temperature.